New chart are uploaded (thanks Rowan). If you want bigger charts email me and I can send them to you. They are about 1.4Mb each and 2900x2300 in size roughly. Excellent work. I tried to do this myself years ago, and I know how much time (and money) it takes to put together a chart like this! Now if only someone could do a chart on Japanese colors! I would like to ask. What is a source or sources of colors and RGB? 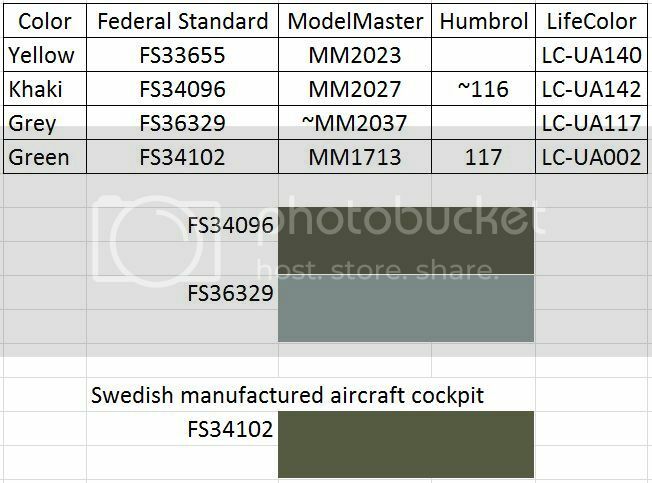 For example the information on "FineScale Modeller", "Scale Aviation Modeller International" pages and at other sources concerning FAA colors is not the same. The RGB of paints from different manufacturers for FAA are also not exactly the same. 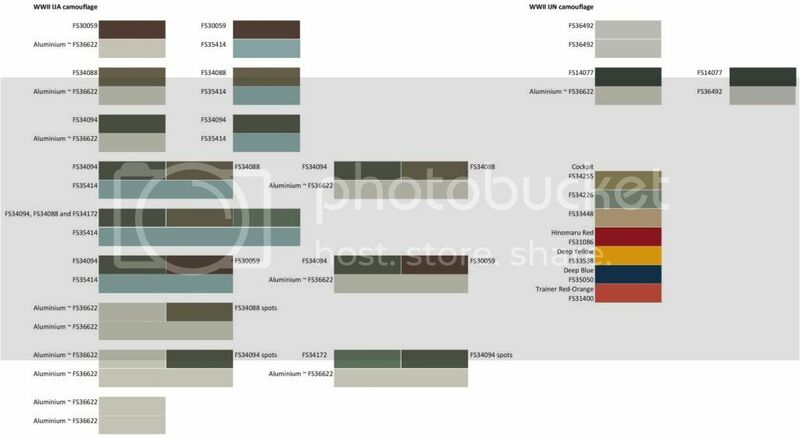 The RLM colour chips are the ones from Merrick and Kiroff's book on Luftwaffe camouflage. I am not sure now but it was a online list. "Compiled and matched by: W.S. Marshall SA Colours & Markings." I have it saved as a PDF file and can send it to you if that is of use? I suppose a Google search would find it as well. Thank you for your effort with this post. Useful. I've find it. Really very interesting. Thank you for links to valuable information. Soviet WWII VVS (military air force) colors took more my time than other investigations. 1. There are 2 different concepts. 2. The restrictions of Federal Standards. One of concepts is based on Erik Pilawskii book „Soviet Air Force Fighter Colours 1942-1945“. The White Ensign Models enamel paints for WWII Soviet planes represent this concept. Mr.Akanihin represents another concept by AKAN paints. Mr. Pilawskii investigation methods were based on paints description found in archive and analysis of photos. Mr.Akanihin method is a bit straighter forward. Mr. Akanihin is dealing with paint examples and paint preparation receipts from archive. Mr.Akanihin claims that AKAN paints represent exact authentically used colors. So I choose Mr.Akanihin concept with addition of some issues from Mr. Pilawskii. Federal Standard describes some certain colors like milestones describe the road and you know where are you. Sometimes the road has too many turns near the milestone. So turns can be described by one milestone only. Or the milestones are too far from turn to describe it. RGB model is 3D representation of colors. It’s like rooms in a building. We can measure and calculate the distance between rooms. 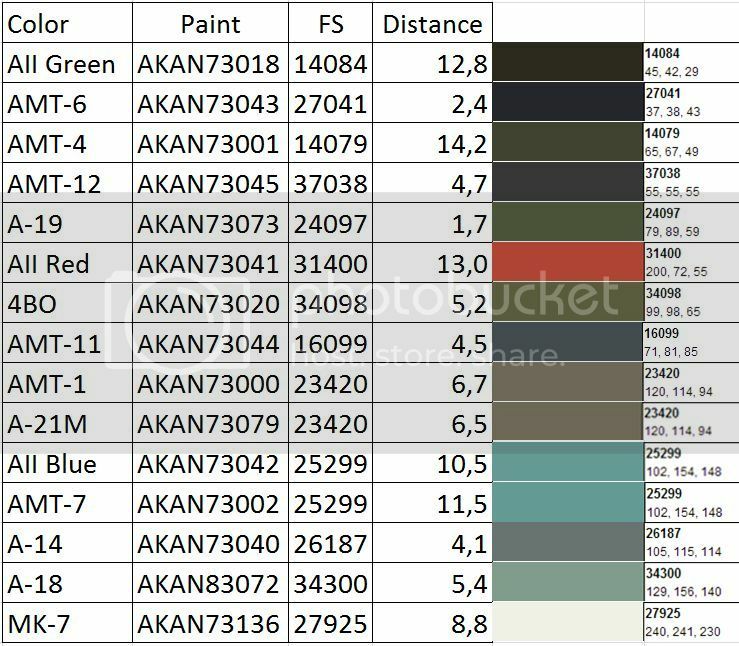 So the first table represents the AKAN color, closest Federal Standard color and distance between. 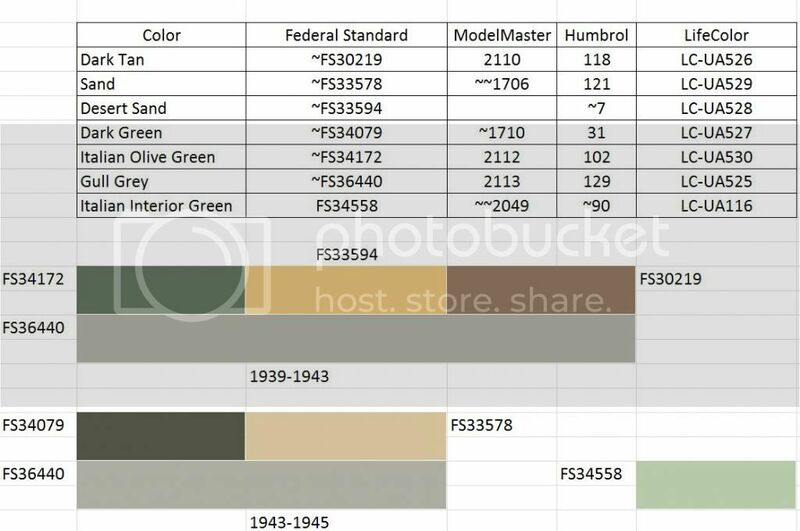 Please note that FS color code means RGB and the first digit is meaningless in this case. Colors are sorted from darkest to white. The AII Green is darker than AMT-6 Black. 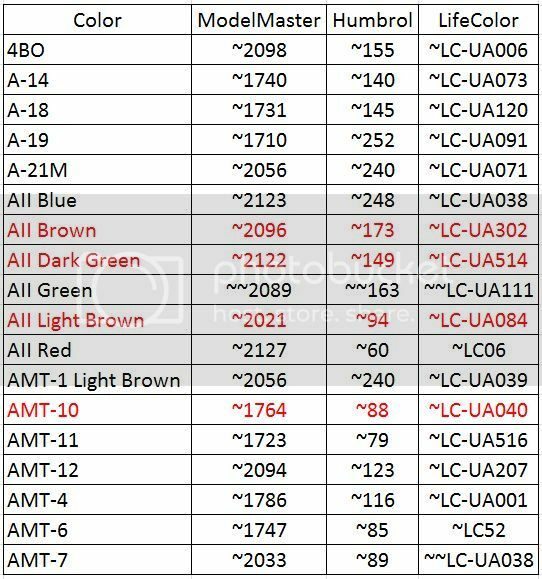 There is no close match in ModelMaster, Humbrol and LifeColor assortment. AMT-1 Light Brown and A-21M Light Brown are very similar and FS23420 covers both colors. It’s good because these colors were used in a way to replace each other. AII Blue is lighter than AMT-7 Blue but the most close described by Federal Standard color is the same. It’s not as good as with Light Brown. 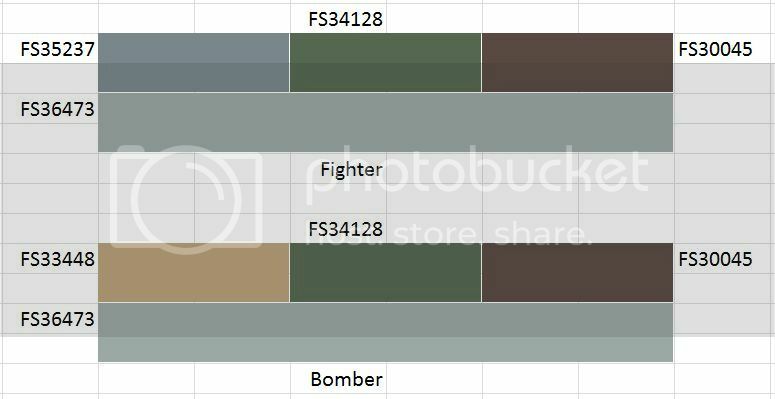 There is a chart of paints for WWII Soviet air force. 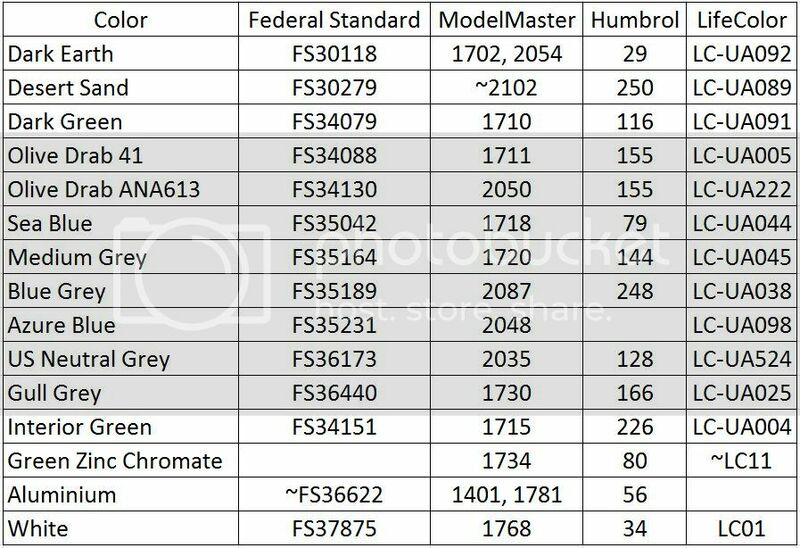 Please note that colors are selected as close as possible to AKAN color and not to FS color as measured in previous table. The red text means this information is not related to Mr.Akanihin. There are needed few words about AII Light Brown, AII Brown and AII Dark Green. Mr.Pilawskii writes in his book about LaGG-3 and Yak-1 planes allocated in Caucasus as a part of South Front. The AII Light Brown and AII Brown were used according this information. Mr.Akanihin doesn’t confirm this information. Well, I’ve included those colors into color chart. Another issue is AII Brown and AII Dark Green colors. Mr.Akanihin doesn’t confirm existence of those colors too. Most modelers know preshading technique. What color will be visible in a case of too thin layer of black? For example let’s use AMT-4 Green and AII Light Brown. I think the source of misunderstanding concerning AII Brown and AII Dark Green is thin layer of AMT-6 Black above AII Light Brown and AMT-4 Green and fading by sun. Mr.Pilawskii used mostly black and white photos for analysis of colors so I think it is very probable occurs in this methodic. The French WWII aircraft camouflage had some variation of color combination. It's good to pay attention to model manufacturer information concerning camouflage colors. There is a common camouflage scheme. There are common schemes of USA aircraft camouflage in WWII. The Olive Drab ANA613 was ordered for use instead of Olive Drab 41 in 1943. But in fact the use of ANA613 in USAF was started at the final stages of WWII. There is picture from my „kitchen“. Yellow means the paint described by manufacturer for certain color. The number below color means the distance from standard. Are you familiar with a company that produces WW2 a/c colours that are water based? I think you mean Vallejo? they do both a airbrush (model air) and a paint brush (model color) line. They have a very comprehensive range of WW2 colours that are in general very accurate and are easy to use. A great choice of paint if you had to choose one. Many thanks for these outstanding and very useful Informations. this link isnt working !! I regret to say that I had to close my website as it was getting too expensive to host just for a hobby. 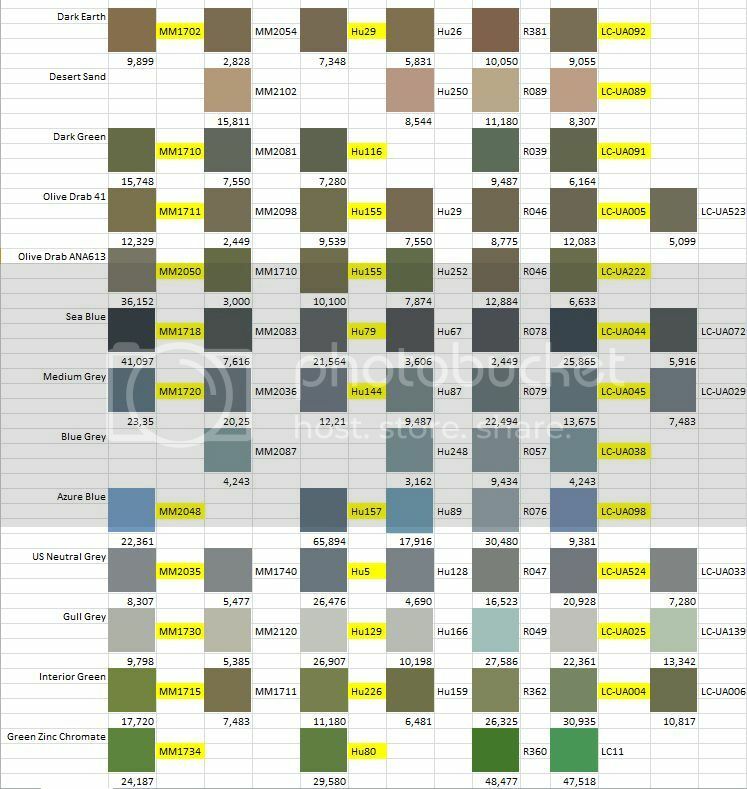 My latest chart (August 2017) has the new Humbrol Acrylic and Enamel RLM ranges added, which are the same as the ones that can be downloaded from the link in post number 1 (except my latest sheet has all the New Humrol enamels apart from number 252).